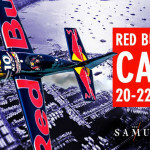 For the second year running, Cannes and its Palais des Festivals hosted the World’s first private equity marketplace known as IPEM. This event gathered 35 countries, 150 inventors, and 150 entrepreneurs throughout 3 busy days, in a structured marketplace to foster business opportunities between private and institutional investors, investment funds, service providers and business owners seeking to support their company’s development. Moor your yacht in the Old Port of Cannes, and take advantage of being at a 2 minutes’ walk from the Palais, perfect to attract all those busy bees from the trade fair. 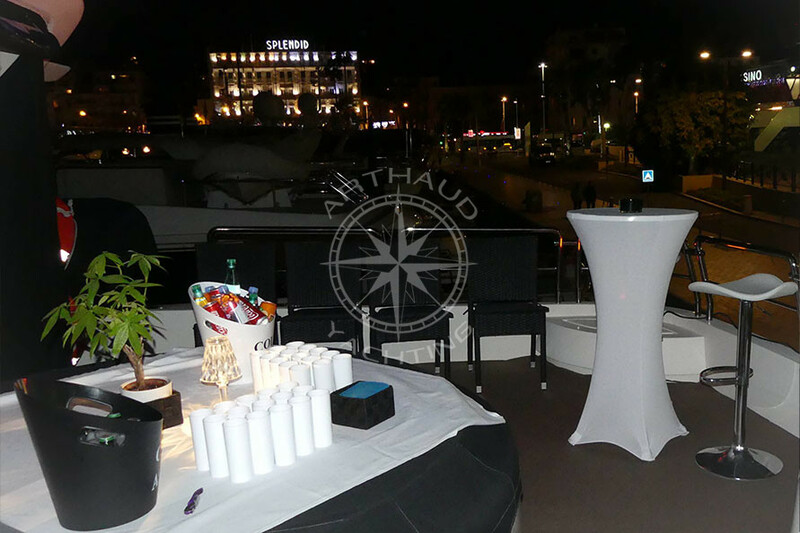 Arthaud Yachting will be your nautical partner for the occasion, fully at your disposal from the conception to the realisation of your completely customizable project. 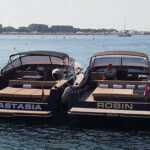 We all know that too much business, kills business so one of the participating companies of this year’s trade faire decided to innovate, and trusted Arthaud Yachting to host THE event of the trade fair. 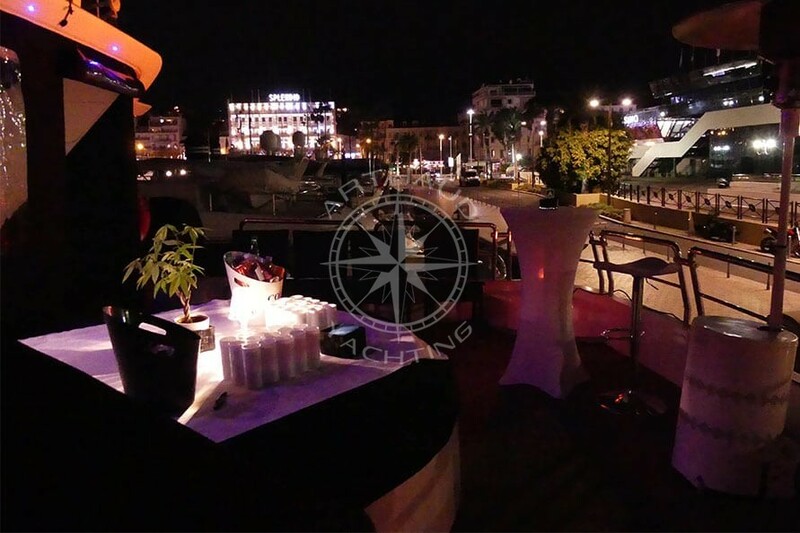 Enough with traditional venues, enough with gathering at your small stall in the Palais, rent a yacht and take full advantage of the ultimate event venue. 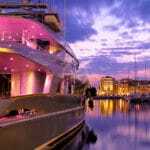 Hosting a cocktail party on-board a yacht is an ideal way to allow your guests, collaborators and clients to get to familiarise with each other, and develop relationships whilst enjoying a bubbly glass of champagne. Make your collaborators feel right at home, and completely customize your yacht at the image and colours of your brand, distinguish yourself and host your corporate cocktail parties on your yacht rental whilst completely immersing your guests; your event will be a success guaranteed in a pleasant atmosphere, where the sense of solidarity and team spirit are reinforced. Our clients hosted their event on the second day of the IPEM trade fair, and welcomed their guests in a completely privatised environment. Moored on the Jetée Albert Edouard in the Cannes Old Port, guests had no difficulty finding their route to the cocktail party, and the yacht event was soon enough in full swing with over 60 guests on-board enjoying the open bar and culinary accomplishments of the private chef on-board. A convivial ambiance, a personalised finger food assortment, the latest hits playing, the finest champagne on flow, and a professional and friendly crew at your service – seduced by this perfect picture? Arthaud Yachting is your ultimate partner to find a yacht to rent in Cannes and to advise you and guide you in the organisation of your yacht event, our services encompass all the skills required to host the best yacht event out there which is sure to be the subject of your office chatter for the next six months!